If you could imagine a modern day version of a Beaux-Arts condominium in Washington, DC, it would probably look just like the Sonata. 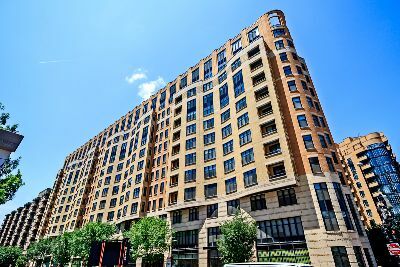 Delivered in 2007, this striking 12-story structure with its dramatic bays looks remarkably like buildings from a century ago, yet with contemporary exterior touches. Located at 301 Massachusetts Avenue NW at the corner of 3rd Street, this was one of the first high-end developments to emerge during the current transformation of the Mount Vernon Triangle. This triangular area, which is just a few blocks from the White House, is a neighborhood and community improvement district, bound by Massachusetts Avenue at the south, the 395 to the east, and New York Avenue to the north, with the western point culminating at Mount Vernon Square. This sleek structure with its super luxury condos for sale, was built by the Wilkes Company, and offers 75 loft-style city homes plus three stories of parking. And as everyone who lives in DC knows, parking can be a rare and elusive thing. Other amenities include a rooftop pool, a state of the art fitness center, and extra storage. Floor plans at the Sonata range from 450 to 1750 square feet, with prices typically starting in the $400s and climbing into the stratosphere for lavish penthouse suites. But even the smaller units are awesome. The layouts include dramatic room shapes, true window walls, 10-foot exposed concrete ceilings, exposed duct work, hardwood floors, and gourmet kitchens with maple cabinets, granite countertops and stainless steel appliances. And then there’s the neighborhood. This pet-friendly building is close to Chinatown, the Verizon Center, and an amazing number of theaters, museums and art galleries. It’s also easy walking distance to the Judiciary Square Metro. There’s a nearby Whole Foods, a phalanx of Starbucks, and tons of bars and restaurants, such as Sixth Engine, Flight Wine Bar, and the Carving Room. Listing information last updated on April 20th, 2019 at 1:03pm EDT.